I run two storytimes on Wednesday mornings: Preschool Storytime (3.5-5 y.o.) at 10 am, and Toddler Time (20 mo-3.5 y.o. with a parent) at 11:30. In my library, Preschool Storytime is a big step up from Toddler Time. 1) Toddler storytime is about 25-30 minutes of storytime and 30-40 minutes of open play (we bring out tons of special toys and let them have at it). Preschool storytime is longer anywhere between 35-50 minutes of stories, songs, and rhymes. 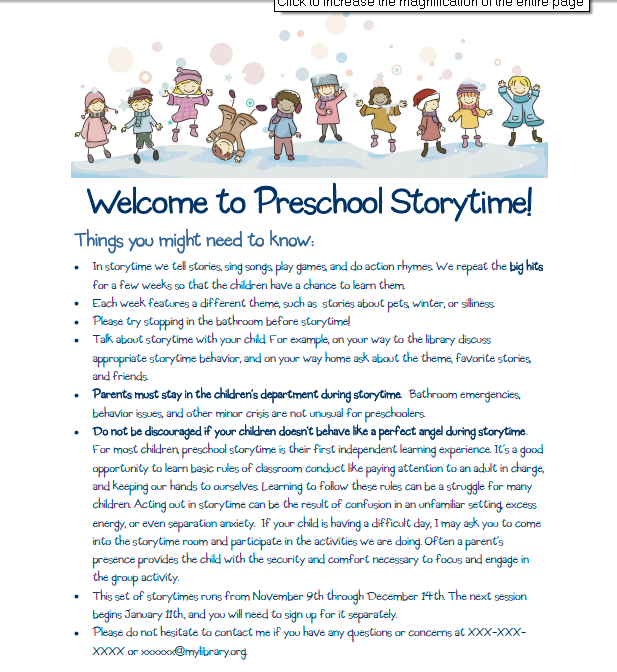 2) Preschoolers are encouraged to leave their parents outside the storytime room. In my experience, most parents don’t realize this is watershed moment in their child’s life: for many preschool storytimers this is their first group-learning environment without a familiar 1-on-1 caregiver. Sometimes kids who have been coming to storytime with their parents for a long time, get a little freaked out when they see the door shut, with Mommy outside the room. And since their emotional equilibrium is delicate at this age, one child’s anxiety can snowball into mass hysteria pretty quickly. For the most part these are silly, hilarious kid stuff. They can be funny, and they’re always interesting. But when they’re all happening at once, and you’re the only grown-up in a room, they get pretty overwhelming. Here’s what I mean. Last session there was one girl (let’s call her Matilda**) who insisted on standing in front of every picture book I read, and pointing at the picture yelling the words she knows in English (whether or not they were relavant to the story): “Pancakes!” “Purple!” “Poo-Poo!”. I must have said, “Matilda, can you sit down on your bottom, please?” at least 20 times per storytime. Another kid, played musical chairs (substituting other children for the “chairs”). Another child tried to hide in storytime room cabinets. Once the other kids saw him do it, they all wanted to squeeze in. And of course, my all-time favorite was the obsession they developed with sitting in my chair. It got so bad that at some point every time I stood up, they would jump up make a beeline for my chair. The result looked like a pileup tackle on the gridiron. Last session, one of my former Toddler Timers was excited to transition into Preschool Storytime. His mom said that if his potty-training was successful, he could start coming to “big boy storytime with Miss Cate”. He talked about it for weeks. And on the first day, he came bouncing into the room, and immediately showed me his Buzz Lightyear underpants. But when the door shut I could see he was nervous. He was a trooper though, and sat very quietly with his hands in his lap. This particular child isn’t the sit-quietly type; he always participates very enthusiastically. I could see he was struggling a little, but I didn’t want to put pressure on him or overwhelm him. I didn’t call him up or put demands on him. About half-way through the storytime (precisely when the Toddler Time toys make their appearance) he came up to me, and with a quivering lip, ask, “Miss Cate, what about the toys?” My heart squinked painfully in my chest. I put my arm around him, and said, “Oh, buddy, the toys are for Toddler Time, we don’t use them in Preschool Storytime.” I turned my head away for just a moment, and when I turned back, these huge spring rain-sized tears were running down his cheeks. I gave him a big hug, and let him mourn for a second. Luckily his mom (who I know very well) was right outside the door. She came right in, I quietly said, “I don’t think he understood there wouldn’t be any toys in this storytime.” She got it right away, and took him out of the room to let him cry it out. Towards the end, he came back in the room, and finished storytime on a positive note. The most disruptive habit, however, occurs when a child decides they want to leave the room. Whether they need a potty break, drink of water, or they just miss Mom, I can’t just let them wander out on their own. I need to make sure there is a parent there to take them to the bathroom, and bring them back. If I’m the only adult in the room, then I have to stop the storytime to find the child’s parent. What’s more, if one child decides s/he wants to leave, they all get the urge to flee. This is no way to run a storytime. This year, I am experimenting with different ways to managing preschooler craziness. Preschool is a wonderful time. The children are so smart, imaginative, and ready for fun. Again there’s no way sure-fire way to make sure every storytime run smoothly. Chaos is a given!!! It keeps me on my toes. Everyday is a new opportunity to share my love of reading, singing, and silly dancing with a group of delight little rascals. Is this how you still run your storytimes? So to answer your question: I don’t handle prek storytime at all anymore, but this approach served me well for 3 years. But like I mentioned in the post I have a high threshold for kid craziness. In fact, it’s what I miss the most about prek storytime. Preschoolers keep you on you toes: you set a boundary, and at least one of them will have a tough time understanding said boundary. I see/hear a lot of librarians tearing their hair out because they can’t get their prek storytimers to “sit in their seats, quietly listening to each story and responding/participating exactly how the librarian expected and planned” as if this is some sort of achievable–or even desirable–goal. I just wanted to offer an alternative perspective. I was just wondering because 50 minutes seemed like a very long storytime to me! I’ve always seen 30 minutes, maybe 45 if there was a craft project at the end. We always require parents to stay in the room – I do have some parents (mostly grandparents) who sit outside during preschool storytime, usually if they’ve got a 4 or older child, but our parents generally stay inside. They sit on chairs at the back or on the floor with their kids, if they’re nervous. Our storyroom opens into our children’s area, so people can always take kids outside for a break or to play if they’re having trouble sitting still. My actual storytime lasts 30 minutes and then we have art time. Every library does what works for them – I usually have 20-30 kids and parents during storytime (we’re a small town) and there’s plenty of room for everyone and I like to have parents participate and deal with any discipline issues. I’m the only children’s librarian, so a helper isn’t possible (sometimes I have a teen or tween in the summer to help, but I can’t count on it). Also, my age target is 3-6 but I often have baby or toddler siblings tagging along, so it’s really a family storytime. Every library is so different. 20-30 seems like a pretty healthy number to me. Our drop in storytime (generally geared towards 2-6 yo) sounds similar. i love family storytime. Preschool storytime (3.5-5yo) is a special case. We encourage the kids to come in along in order to provide that independent learning experience. For kids who have never been in a in preschool/daycare situation this is can help them adjust. We do try to keep the number of registrations low. We have 30 spaces, but on any given day, we have around 20 kids in the room. we’re medium size district library, right across the Chicago city limits. Our program/lending policies are very open, so we attract a good number of patrons from the NW side. Wow, this is such a useful post! It always helps me so much to see how other people manage their story times. I’ve been working on a document similar to yours, but I can see I’ve forgotten some important things. Thanks for the inspiration! Also, I think it’s a wonderful idea to have a second adult in the room during story time. We are pretty short-staffed, so I don’t have that opportunity, but given some of our recent behavior problems, it’s something I might just bring up to my manager. Sadly, though, my behavior problems tend to be adults, not children, and they’re harder to handle. Thanks Katie. that’s allowing me to make a big, “PHEW”. 1) I was a little worried this post was a rambling disaster (i guess it wouldn’t be my first. haha.) 2) Also, I have to admit i felt a little vulnerable, since to some degree I admitted publicly that storytime is rarely under my control. it’s good to just let it all hang out. cheers! I am very lucky to work in a library with a large YS staff. But I think you could make a very strong argument that this is worth the staff time. Also, the “wingman” doesn’t have to be in your department. You might be able to lure someone from another department (who like kids even if they don’t work full time in YS). Or I wonder if you could recruit a few helpers from the parents. You would probably have to organize a little training session, but it would be a great opportunity to increase buy-in among parents to the importance of early literacy.